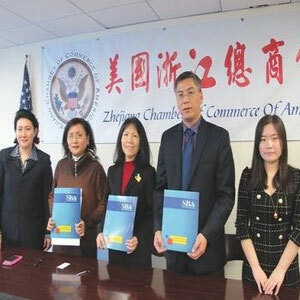 SBA, the U.S. Zhejiang Chamber of Commerce of America, and E888 International announced to hold an international business expo and signed contract at the press conference. 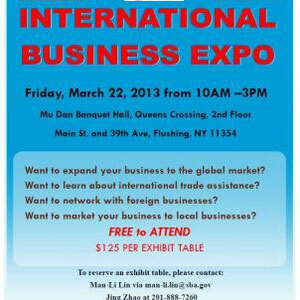 The international business conference will be held on March 22nd from 10am to 3pm at Peony Hall, Queens Crossing in Flushing. From 10am to 11am during that day, the official delegates from SBA and the U.S. Department of Commerce explain how the U.S. departments help international trade. From 11am to 1pm, each company introduces their products and services they provided. 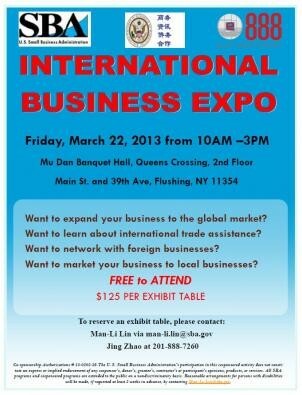 From 1pm to 3pm, companies can communicate with companies that are on exhibit. Exhibition information is as follows.